Outlook on the web shows the mobile devices that you use to connect to your mailbox. If you're no longer using a device or a device isn't syncing properly, you can delete it from this list. Doing so removes the partnership between the mobile device and your mailbox, but doesn't delete the email account from your phone. Removing this partnership by following the steps below often fixes sync issues. 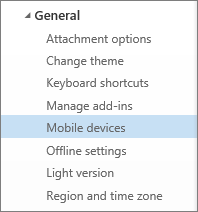 Choose Settings > View all Outlook settings > General > Mobile devices. Select your device in the list, and then select to delete the device partnership. At the top of the window, select Save. If you only want to remove this device from the list, stop here. If you're attempting to fix a sync issue, continue with the remaining steps. Go to your mobile device and power it off completely. Restart your mobile device after a few seconds, and then sync your mailbox again. Choose Settings next to your name in the upper-right corner of the page, and then click Mail. In the left navigation bar, under General, choose Mobile Devices. Select your phone in the list, and then select Remove to delete the device partnership. Select Yes in the confirmation box.